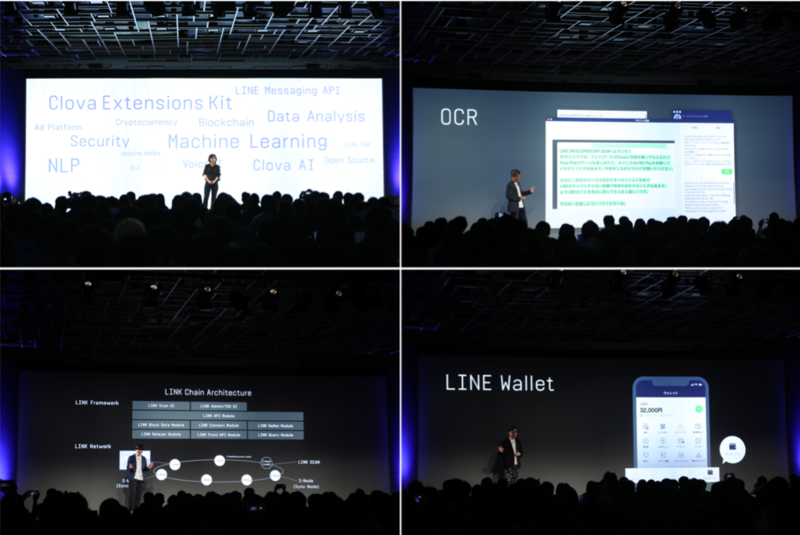 TOKYO – November 23, 2018 – LINE Corporation held LINE Developer Day 2018 on November 21, highlighting LINE’s technical endeavors over the past year, the company’s future plans, and a wide range of other engineering-related topics. LINE has been holding LINE Developer Day, its technology conference for engineers, annually since 2015. This year’s event was held at the Happo-en in Tokyo, offering over 60 sessions under the concept of “Next LINE.” More than 1,000 in-house and visiting engineers from Japan and overseas attended, learning about LINE’s efforts in developing new technological fields and LINE’s vision for the future. At the opening session, CTO Park Eui-vin stressed two key terms – “connect” and “mutually beneficial ecosystem” – as the values that LINE aims to achieve through the implementation of Next LINE. In addition, the opening addressed LINE’s efforts in AI and blockchain, and then the fintech-related services being implemented on the LINE platform were introduced by the leading personnel of each service. Connect: This refers to enriching users lives through widening the ways in which technology interacts with people – not only using online services, content, and information, but also through devices that can be used in the offline world, like speakers and automobiles. Mutually Beneficial Ecosystem: This refers to creating an ecosystem that benefits developers, users, and LINE. It’s not just about creating profits through APIs, but also making a system where the value and advantages of the various services provided by developers are returned to users. During the event, LINE announced the Clova AI Tech Demo, a website that introduces the company’s AI technologies, like OCR and NLU (natural language understanding). During the Chatbot Engine session, the speakers covered integrating NLU technology for text and voice interfaces, which is not currently possible with the LINE Messaging API. Also discussed was how OCR can recognize a string of characters in an image, and then copy, paste and translate those texts (a service available only on the desktop version of LINE at the moment). After 2019, LINE will commence its B2B business, providing those AI technologies and more to external developers and businesses. LINE also introduced its Clove AI Tech Demo website, which presents the AI technologies that can be useful for external developers and businesses. For instance, Clova Video Highlight can be used for selecting and editing specific figures appearing in an image, while Clova Chatbot Builder allows developers to easily create powerful chat engines. Another major project in the spotlight at LINE DEVELOPER DAY was LINE’s digital token ecosystem and blockchain network, LINK Chain. As part of its plans for developing this ecosystem, LINE is scheduled to open LINK Chain to its partners and external developers after spring 2019, so LINE’s partners and external developers will be able to provide decentralized applications (dApps) on the LINK Chain platform. A variety of fintech-related services launched this year, including LINE’s digital token exchange BITBOX; LINE Insurance, LINE Smart Investment, and LINE Household Account, which were released in the fall; LINE Wallet, a financial service gateway; and My Card, a new function for LINE Wallet that enables users to comprehensively manage mileage and membership cards. In addition, LINE Pay for ID Payment, a LINE Pay feature that is currently in the works, was introduced. (Note: LINE Pay for ID Payment is a function that links delivery addresses and credit card information on LINE so users do not need to enter their information on each e-commerce website). Following the keynote address, smaller sessions were held to explore more specific topics in detail, including LINE’s advertising platform, infrastructure, security, and data, along with new technologies like AI and blockchain. Lightning talk and poster sessions were also provided to encourage engineers and other participants to interact more with each other. There were also exhibits set up where participants could try out various LINE services, like a Clova-activated photo booth and a Face Play experience area. Under its corporate mission of "Closing the Distance," LINE will strengthen its alliances with external companies and partners as well as external developers, and undertake various initiatives. In doing so, LINE will bring users closer to a wide variety of information, services, and products, and create comfortable relationships.